Junior netminder Matt O’Connor was named Hockey East Online Defensive Player of the Week after recording his first career shutout on Friday night against Michigan State and then holding potent Michigan to two power play goals as BU swept its guests from the Big 10. O’Connor was making his first two starts after sitting out BU’s earlier games due to an injury. He stopped 67 of 69 shots for a .971 save percentage to go with a 1.00 GAA. Junior Ahti Oksanen, who scored the game-winner—and only goal—against MSU and then got BU on the board against Michigan, was named to the weekly list of top performers. BU’s pair of wins helped its conference take a 16-12 overall lead in the 2nd Annual Big Ten Hockey East Challenge. In College Hockey News’ Hockey East Blog, Joe Merloni looks at how the influx of freshman talent has helped generate a strong start for BU, which is 3-0 for the first time since 2008-09. SB Nation’s Jeff Cox looks at Hockey East teams he feels have been overrated and underrated based on performance in the early going. He puts the Terriers in the latter group. With 2015 NHL draft targets Terrier freshmen Jack Eichel and AJ Greer, and Michigan first-year blueliner Zach Werenski on the ice, NHL scouts flocked to Agganis Arena. SB Nation examined each skater's performance. ● The Daily Free Press’s Maya Deveraux’s Instagram photo shows the celebration following BU’s game-tying goal. Doyle Somerby (27), Eichel (9), Oksanen (2) and Dan O’Reagan (10). BU’s victory over Michigan on Saturday was by the same 3-2 score (video) as in the Wolverines previous visit to Agganis Arena in October of 2009, when Joe Pereira’s unassisted goal late in the third period provided the winning margin. BU is now 3-0 vs. Michigan at Agganis Arena. The third win was a 7-2 victory in 2008, exactly six years to the day of Saturday’s win. Overall, BU trails in the series with Michigan, 11-14, and has never won a game at Michigan’s Yost Arena. ● USCHO’s weekly national poll ranks BU 6th, up from #12. ● In the USA TODAY/USA Hockey Magazine national poll, Terriers are also 6th, up from #11. With 13 goals and 14 assists in 11 league games, 2016 recruit Patrick Harper leads all scorers in the Mass Selects Midget U18 division. 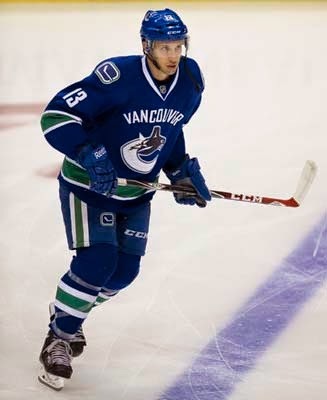 Former Terrier Nick Bonino (photo) scored the go-ahead goal and then assisted on the game-winner to earn first-star honors in Vancouver’s 4-2 win against Washington. Congratulations to former Maine netminder Scott Darling who made his NHL debut last night for the Blackhawks, backstopping at 2-1 win over Ottawa. The only goal Darling allowed was assisted by ex-Terrier Alex Chiasson. Darling, who grew up in Illinois rooting for Chicago, had nine minor league stops since leaving the Black Bears in 2010. He is reportedly the only player to reach the NHL after having played in the Southern Professional Hockey League. AHL: Former Terrier captain Garrett Noonan (photo above) scored his first goal as a pro tying the score for Milwaukee at one apiece in the third period. 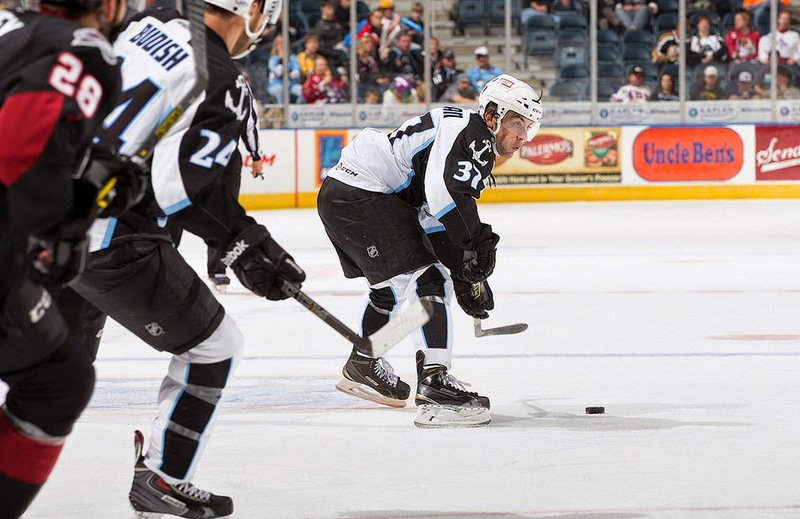 The Admirals then defeated Lake Erie in a shootout, 2-1. AHL: Former Terrier Brandon Yip scored his first goal of the season in Norfolk’s 6-3 loss to Springfield. ECHL: On opening night, Sahir Gill initiated the scoring for Wheeling nine minutes in as the Nailers routed South Carolina, 5-1. 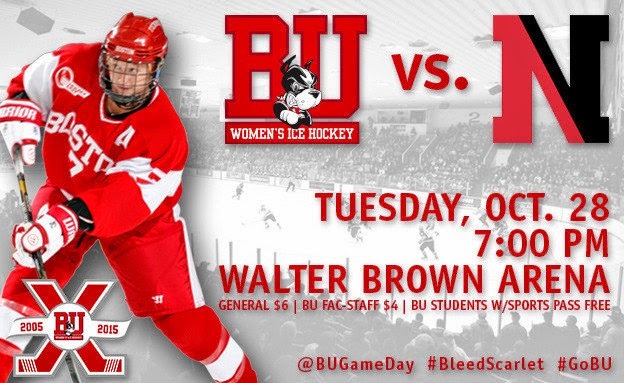 Three-time defending Hockey East champion BU opens its home schedule tomorrow (Tuesday) against cross-town rival Northeastern. The teams last met in the 2014 Hockey East tournament semifinals with the Terriers edging the Huskies, 3-2. Puck drop at Walter Brown Arena is at 7 p.m.
Terriers remained in 6th place in the national rankings in both the USCHO and USA Today/USA Hockey Magazine polls. Senior Shannon Doyle was named to the Hockey East Weekly top performers list after recording two assists and seven blocks in BU’s split with Maine this past weekend.